The application for the 2012 conference is now available online. Some information is still forthcoming, such as who this year’s mentors will be. No doubt they’ll be an impressive collection from the top agencies and houses in the business. What’s different about this event is that writers have to apply with a sample of their work and be accepted to attend. 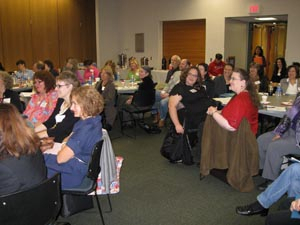 As a result, you find the writers attending RUCCL to be more seasoned than at other conferences. The other positive is the length of time you get to spend with a one-on-one mentor. At 45 minutes, it’s significantly longer than at any other event.